Pre-patterned resin-based films are ready to transfer in the leather industry and allow soft-touch effects. More than 500 varieties of texture pattern, flower, animal patterns and geometric patterns are available. It is commonly used in women’s, children’s and men’s clothing, home textiles, shoes, handbags, accessories, and T-shirts printing. Genuine and artificial leather, suede, nappa and fur are common application media. Velvet, Linen or textured fabrics can be applied too but there may be some loss at fine pattern dots. Total thickness of film and resin is 100-200 micron. Normally resin colour is transparent but can be manufacture as beige, brown, white and black. For partial transfer, parameters are temperature 150C, pressure 6 bar, duration 5 sec. For continuous rotary printing, temp. 160C, pressure 6 bar, speed of stamp 3-5mts/min. After transfer, carrier film should not be separated too soon. 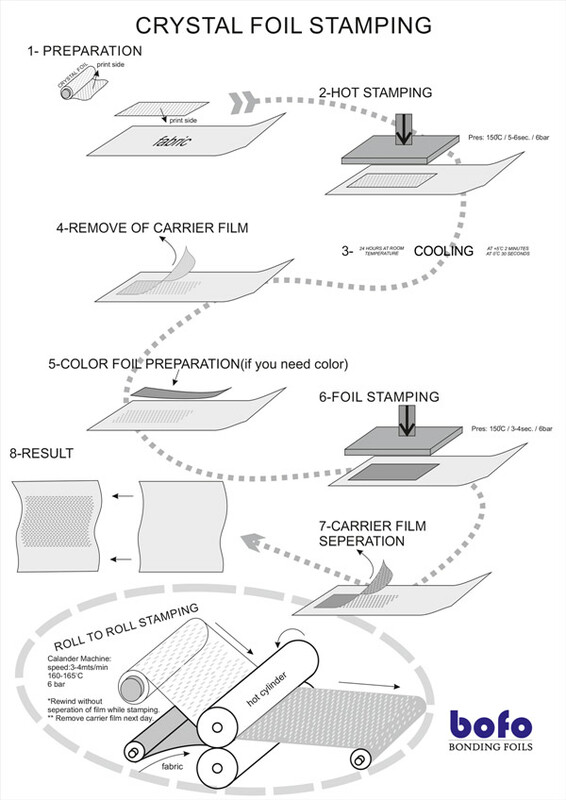 It is ideal to separate the carrier film after 3-4 hours after the stamping process. For quick separation of the carrier film, it should be cooled below 5C to make resin state solid for an easy separation. It is also available to stamp foil onto laser film around 140-150C. The best parameters can be change according to workshop real conditions. Put on Laser film onto fabric or leather. For leather stamp press, presure:100bar, temp: 110℃, duration: 3sec. Partial fabric press, pressure: 6bar, temp:150C, duration: 5-6sec. Rotary stamping machines, pressure: 6bar, temp:150-160℃, speed:3-6mts/min. Stamped products must be cooled down at 5C. If there is no cooling process, it is needed 4-5 hours after transfer to seperate carrier film. Laser films can be used as original transparent effect, or can be colored by tansferring of hot stamping foil.